The dictionary defines a “perfect storm” as “a detrimental or calamitous situation or event arising from the powerful combined effect of a unique set of circumstances”. It is also, in our opinion, an appropriate and pragmatic way of describing the wide and diverse array of catalysts for the ongoing correction in the equity markets. 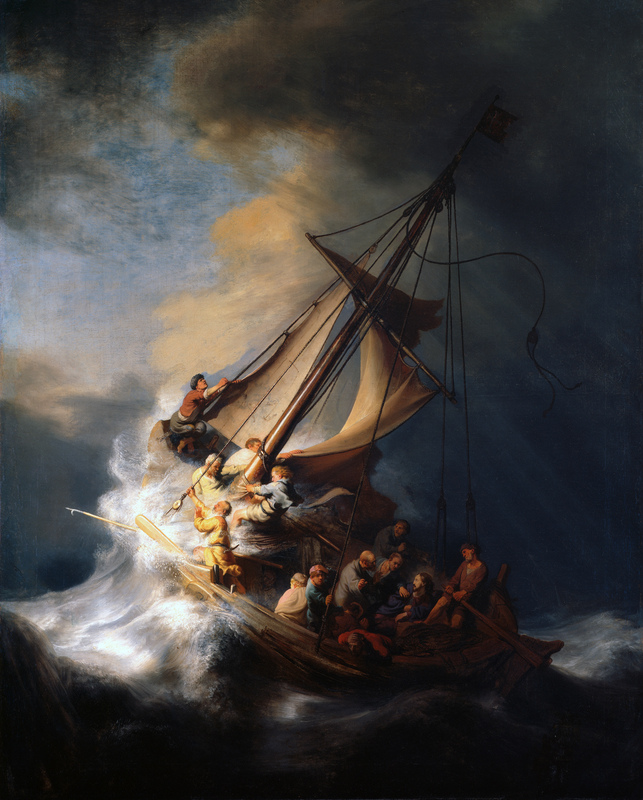 Like a perfect storm, the equity market correction caught many investors off-guard by its suddenness and its ferocity. However, that perception is probably attributable primarily to the fact that the broadest of the popular market indexes (the Standard & Poor’s 500 Index and the NASDAQ Composite) are capitalization-weighted, thus giving the largest companies an overwhelming sway on the performance of the indexes. In this instance, because those giant companies with the greatest influence on the performance of the indexes (like Apple, Microsoft, Amazon, Johnson & Johnson, and Exxon) did not join in the decline until the second week of October, it had looked to the world like the “sea” remained calm, and that the domestic equity markets remained in a firmly bullish trend. However, under the surface, this storm has been brewing since the end of August. In fact, while the Dow Jones Industrial Average and Standard & Poor’s 500 Index were still sitting at or near all-time highs, the number of New York Stock Exchange-listed stocks trading at 52-week low prices was three times higher than the number of stocks trading at 52-week highs. This is the first time since December 28, 1999 that such a disparity has occurred, and only the second time since 1965. Moreover, September’s 3.7% out-performance of large, blue chip stocks over their smaller brethren was the largest monthly gap in four years. 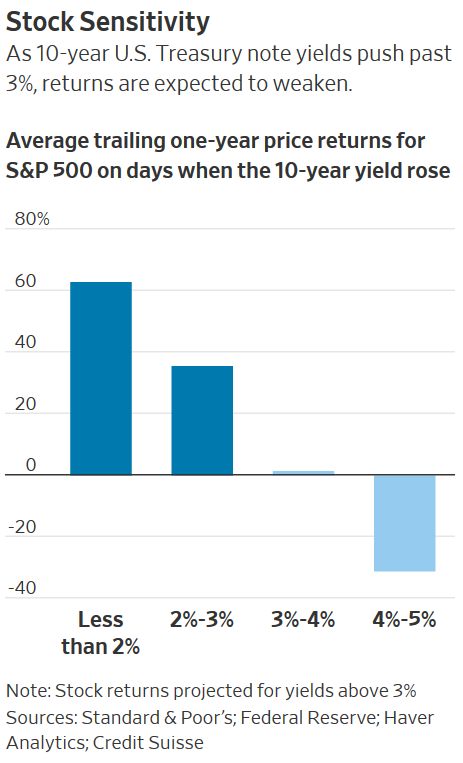 This divergence has been bigger only seven times in history, and two preceded major declines in the stock market, including the aftermath of the bursting of the technology bubble in 2000 and the Great Recession from 2007 to 2009. 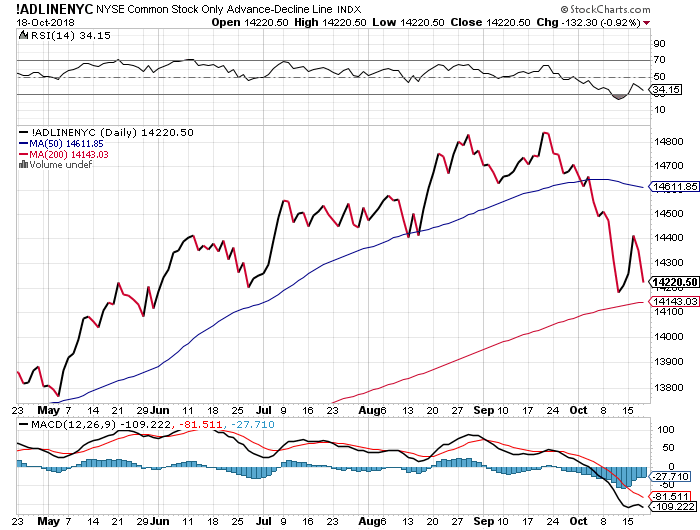 In short, the capitalization-weighted composition of the major stock indices has been obscuring a significant decline that has already been underway in the broader market for about six weeks. However, it was not until October, with its well-earned reputation for sharp declines in the stock market that this tumultuous but largely ignored undercurrent developed into a raging “perfect storm”. Of critical importance, the aforementioned requisite “powerful combined effect of a unique set of circumstances” appears to be of varying durations of impact. Indeed, we suspect that all three of the major catalysts for the recent increase in the severity of the “storm” will be rather short-lived in their influence. The first of these is the mid-term election cycle, which we addressed in great detail in the September Per Stirling Capital Outlook, and which was the primary reason why we concluded last month’s report with the cautionary statement that “investors should be prepared for a potential uptick in equity market volatility”. As was noted in the September report, the S&P 500 historically averages a pre-election decline of almost 19% during midterm election years. 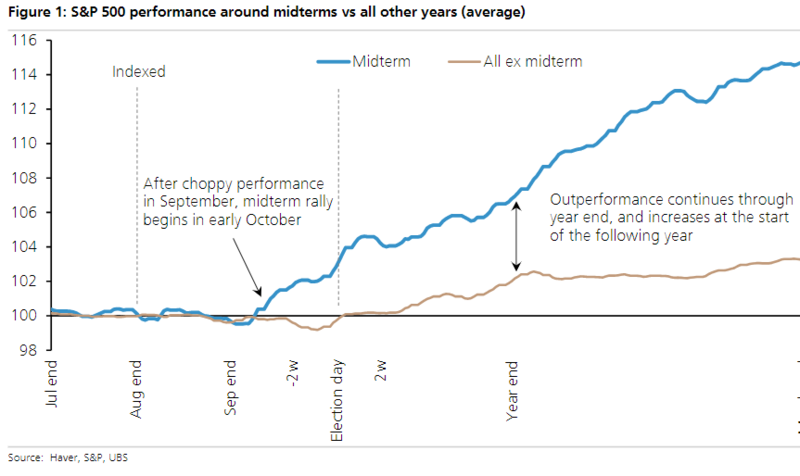 So strong is this bearish tendency that, according to LPL Financial, the S&P 500 actually averages negative year-to-date returns through early October of midterm election years. In contrast, while the past is not necessarily prelude, it is noteworthy that the post-midterm-election period has historically been very bullish for the domestic equity markets. We believe that a second significant short-term bearish influence has been tax-loss selling by mutual funds, most of whom conclude their fiscal year in October, and thus need to complete any strategic tax selling (to offset taxable gains for shareholders) in time to settle the trades by the end of the month. In our opinion, the end of mutual fund tax-loss selling is one of the major reasons why the most bullish part of the year for the equity markets tends to start in or around mid-October. In the above chart, which we also included in last month’s report, you can see not only the historical tendency for equity markets to rally starting in mid-October, but also how this bullish tendency has historically been even more extraordinary in midterm election years. It is also noteworthy that both of these negative catalysts (the tax-related selling and the election uncertainty) should, by their very nature, run their course over the next two and three weeks respectively. In some regards, another major catalyst for the stock market’s ongoing decline, the significant and very rapid jump in the 10-year Treasury yield, should prove to be equally transitory, as we maintain that equities have reacted so negatively not because rates moved higher, but instead because they moved higher so quickly (a pace that we do not expect to continue). Importantly, we are not suggesting that we are at the end of the Fed’s rate-tightening cycle, or that interest rates in the economy are not destined to move higher. Instead, we are noting that stocks can move higher in the face of higher interest rates for so long as 1) rates move higher at a modest pace and in a rational way and 2) that investors remain confident that monetary policy remains proactive, and sufficient to keep inflationary pressures at bay. As will be discussed in detail, this was, in our opinion, a true “sea-change”, as it caused Wall Street to almost entirely reassess its expectations for how many more times the Fed will raise interest rates in this cycle. This is of critical importance because of the normally inverse relationship between interest rates and equity valuations. Specifically, the market tends to support quite lofty stock prices (relative to the earnings of the underlying companies) when rates are low and vice-versa. In this instance, the sharp surge in rates that started in late August catalyzed the selling of the market’s most highly valued (relative to current earnings) growth stocks, progressing from smallest to largest. You can see the severity of this decline in the above advance/decline line, which measures the number of New York Stock Exchange-listed stocks that are advancing versus declining on a daily basis. Indeed, we believe that Chairman Powell’s comments likely marked the end to the “lower-for-longer” interest rate premise that has been a mainstay of this historic bull market, and has allowed the markets to support higher-than-normal equity market multiples. That said, history shows that stocks can indeed advance in the face of higher rates and that it tends to be the rate of ascent rather than the direction of interest rates that roils the equity markets. 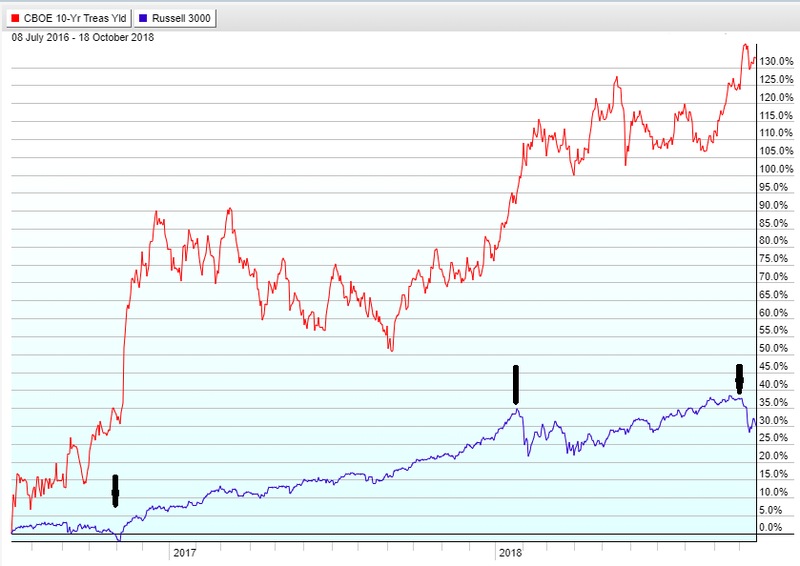 For evidence, you need look no further than the following equity prices versus yield chart, which clearly illustrates that the index of America’s 3,000 largest public companies (blue) has gained 30% over a period during which the yield on the 10-year Treasury note (red) has surged by 132%. 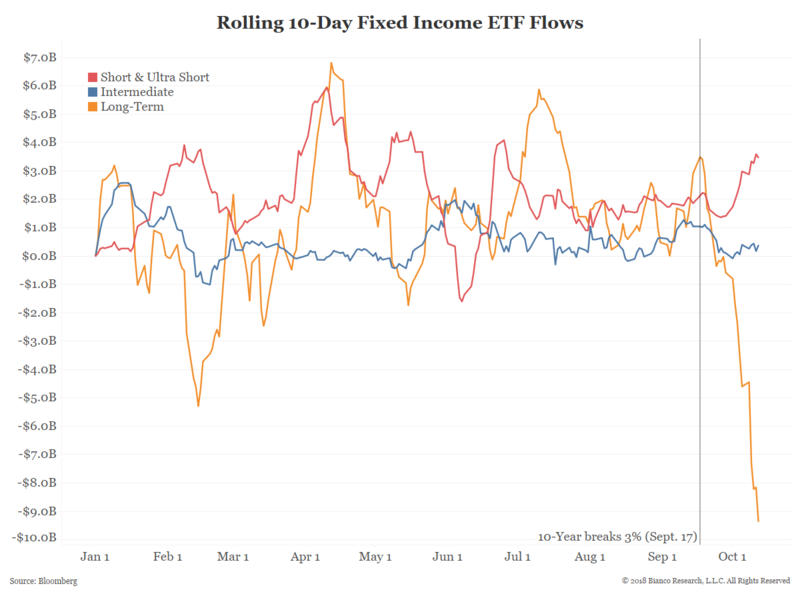 Importantly, it further shows that all three of the period’s substantial equity market declines were associated with a rapid rise in interest rates. Of note, the markets do seem to be growing increasingly concerned over the question of whether or not monetary policy is still out in front of inflation. In the meantime, our work suggests that the sharp acceleration in interest rates is now at least temporarily behind us, and that this particular catalyst may also have already had most of its bearish impact. The inflation question is, in our opinion, of critical importance, as research strongly supports the idea that investors behave very differently when they have inflationary expectations as opposed to deflationary or disinflationary expectations, and that this investor behavior manifests itself in the price correlations between stocks and bonds. Specifically, when inflation is not a concern to investors, stocks and bonds tend to trade independently from one another. This hedging attribute forms the basis of a “balanced” portfolio, through which overall portfolio volatility is dampened by mixing non-correlated asset classes (traditionally stocks and bonds). 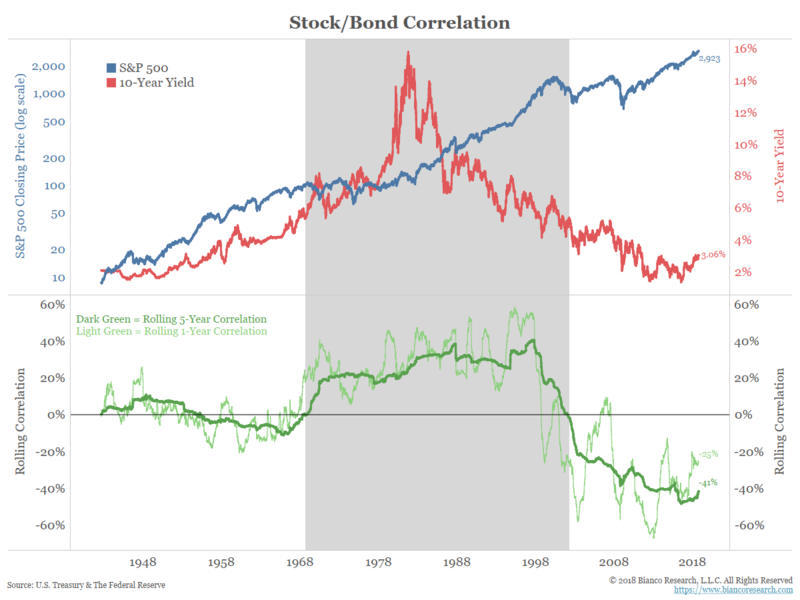 However, history suggests that, in periods like 1968 to 2000 (grey area below), when inflationary concerns are prevalent, stocks and bonds tend to trade in correlation with one another, which greatly diminishes the hedging benefits of diversified portfolios. With the inflationary risks associated with a very old economic expansion, President Trump’s tariff-based trade policies, and what former Federal Reserve Chairman Alan Greenspan just called the tightest labor market he’s ever seen, there is a growing concern that we are returning to a period of more highly correlated asset classes and less protection being provided by diversification. In our opinion, this helps to explain why stocks and bonds have recently been falling in unison. Indeed, the stock and bond asset classes are currently demonstrating the tightest correlation in price movements that we have witnessed in two decades. Of note, such changes in correlation have often tended to be quite challenging for the equity markets, and there is strong evidence that this perceived change in correlation has contributed greatly to the recent decline in both stocks and bonds, as a result of both the unwinding of “risk-parity trades” and the recent lack of protection being provided by portfolio diversification. In risk parity strategies, bonds (or the bond portion of a portfolio) is/are leveraged to bring overall portfolio volatility in line with that of an equity market benchmark. The theory is that this strategy allows for the possibility of producing above-equity market levels of return, but with only equity market levels of risk. However, when stocks and bonds both fell so aggressively, it pushed the volatility of these strategies well above the targeted ranges and catalyzed forced selling of both asset classes. The same type of scenario played out in the portfolios of many of the over 35 million American investors who rely upon investment advisers to manage their over $70 trillion in investable assets. Many of these advisors have traditionally relied upon the diversification benefits of 60/40 or 70/30 stock-to-bond portfolio mixes. However, when both asset classes fell in unison, many advisors raised cash in portfolios to protect their clients, which clearly exacerbated the selling in both asset classes. However, since we do not necessarily anticipate a need for either investment advisors or risk-parity managers to replicate such a dramatically defensive reallocation, we believe that this is yet another bearish influence that may very well prove transitory. That said, none of the above is intended to suggest that nothing has fundamentally changed, and that all of the recent volatility is just noise, or that all we really need to do is to just get past the elections and everything will somehow magically return to the unabatedly bullish environment of two months ago. No, in our opinion, markets have indeed changed in important and fundamental ways. We have already noted our belief that the inter-relationship between stocks and bonds has been changed as a result of the re-emergence of inflation-related concerns, and that the “lower for longer” premise no longer applies. It is also pretty clear that the so-called “Fed put” has expired. To explain, if Janet Yellen or Ben Bernanke were still in charge of the Federal Reserve, they would likely be giving speeches and writing editorials about how the Fed stands ready to step in if the market turmoil continues. In contrast, Chairman Powell gave a speech in the midst of last week’s market decline and, rather than attempting to calm the markets, he doubled down on his commitment to continue raising short-term rates due to the fact that the U.S. economy is in the midst of a “remarkably positive” period that is unprecedented in modern U.S. history. Perhaps most importantly, for the first time in over ten years, we are witnessing positive “real” yields, which means that the Federal Reserve is no longer essentially paying banks to borrow money from the Fed by keeping the Fed Funds rate below the inflation rate. This means that the Fed is essentially no longer accommodative, and that the days of easy money (the longest period of accommodation in America’s history) are increasingly behind us. Indeed, for the first time in 124 months, the Fed Funds Rate is now higher than is the retail inflation rate. 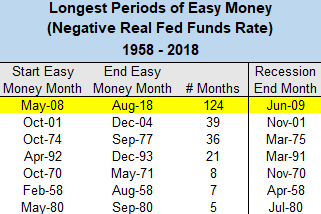 This period has been so extraordinary as, unlike periods in the past when the central bank withdrew accommodation at the first signs of recovery, the Fed has actually maintained monetary accommodation (i.e. emergency measures) for over nine years beyond the end of the recession. What the full implications of this will be remains to be seen. 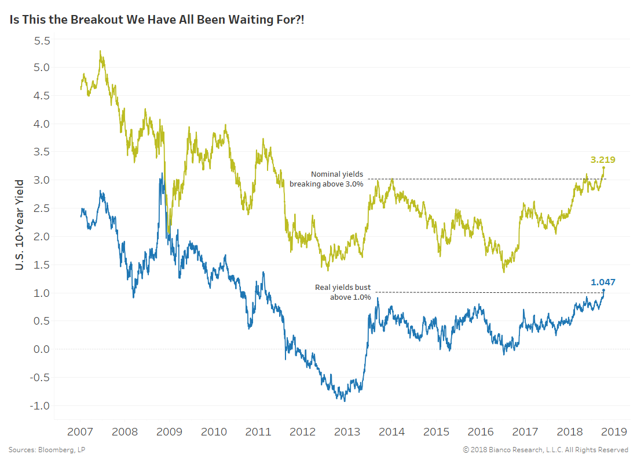 In the meantime, we are also seeing the normalization of interest rates playing out on the longer-end of the yield curve, with the real yield (nominal yield minus inflation) on the 10-year Treasury note nudging above 1% for the first time in almost a decade. According to some very interesting work done by Bianco Research, this may have some very important implications for many public companies with less-than-ideal balance sheets. 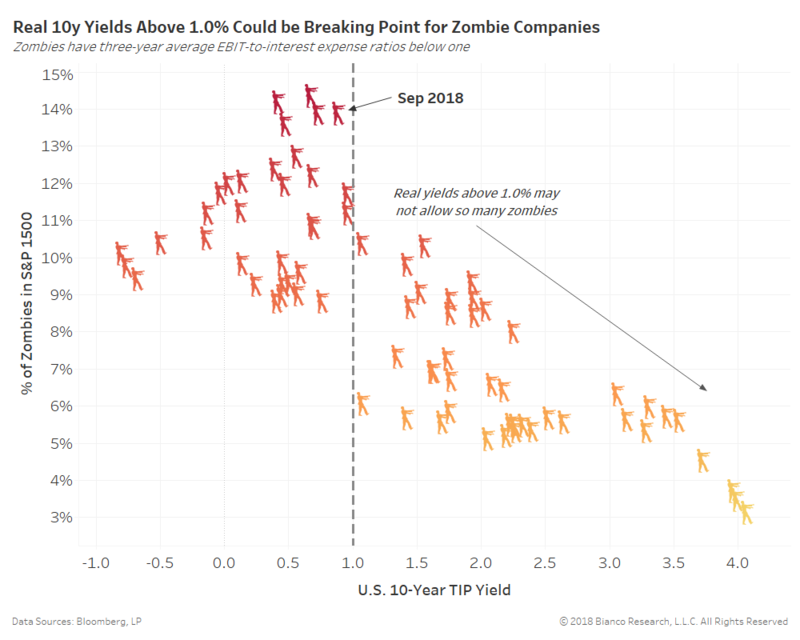 To explain, one of the implications of the Federal Reserve keeping monetary policy so incredibly accommodative for such an extended period of time is that the ultra-low interest rates have allowed many so-called “zombie companies” to survive by financing operations through borrowing, whereas they would likely have already been acquired or gone out of business under a more normal interest rate scenario. This has led to an environment where approximately 14% of all companies included in the Standard and Poor’s 1500 Index are at some risk of insolvency as rates return to more normal levels, which could have far-reaching implications for the low-quality stock, high-yield bond and adjustable-rate loan markets. As you can see from the chart, Bianco’s research suggests that a 1% real inflation-adjusted yield on the 10-year Treasury will be a critical inflection point for many of these companies. We believe that the markets have almost fully priced in the interest rate increases necessary to bring monetary policy to a “neutral” stance from a purely economic perspective. 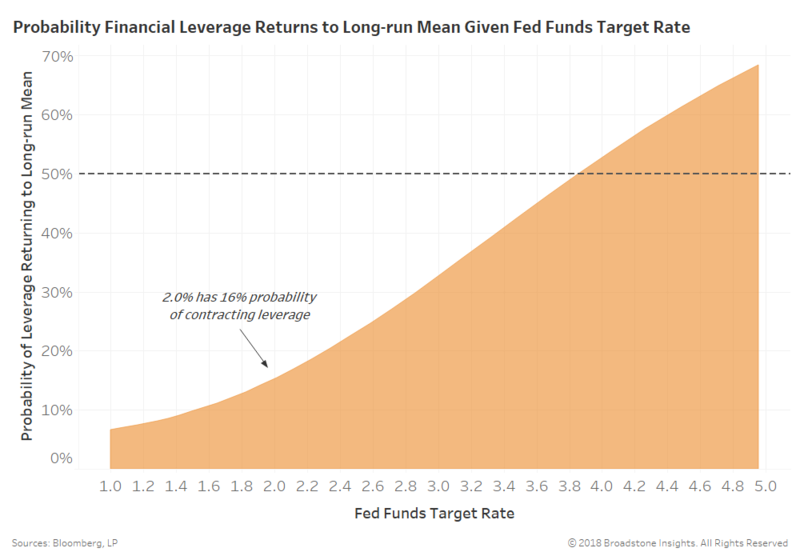 However, we do not believe that the markets are pricing in the number of rate increases that would likely be required to normalize financial leverage, which is the stated Fed concern that the markets continue to ignore. Further, it is clear that the headwinds being created by the combination of higher rates and the current trade conflicts are impacting both economic growth and corporate profits on an increasingly universal level. John Kenneth Galbraith noted that “We have two classes of forecasters: Those who don’t know–and those who don’t know they don’t know”. With that as our caveat, we believe that we are in the midst of a pitched battle between bulls and bears, as each side fights for control of the equity market trend. 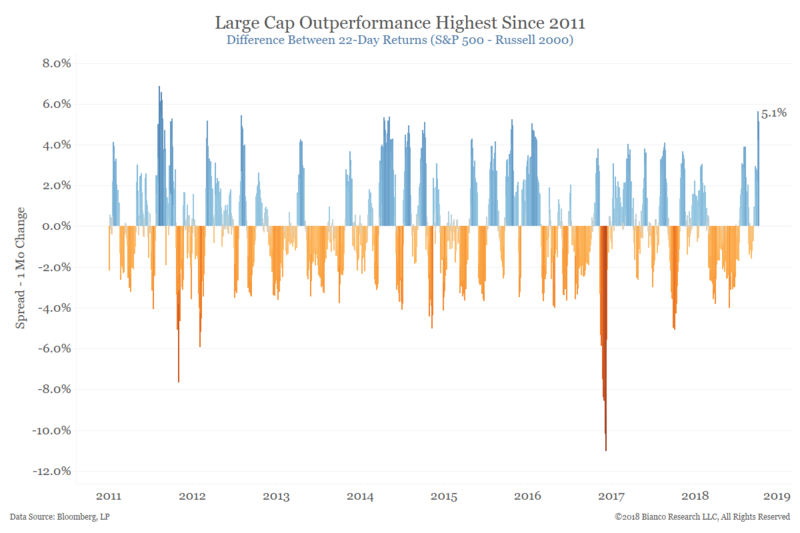 This battle is evidenced by the extraordinary volatility of recent days, five of the past seven of which have seen equity prices move by at least 1%. 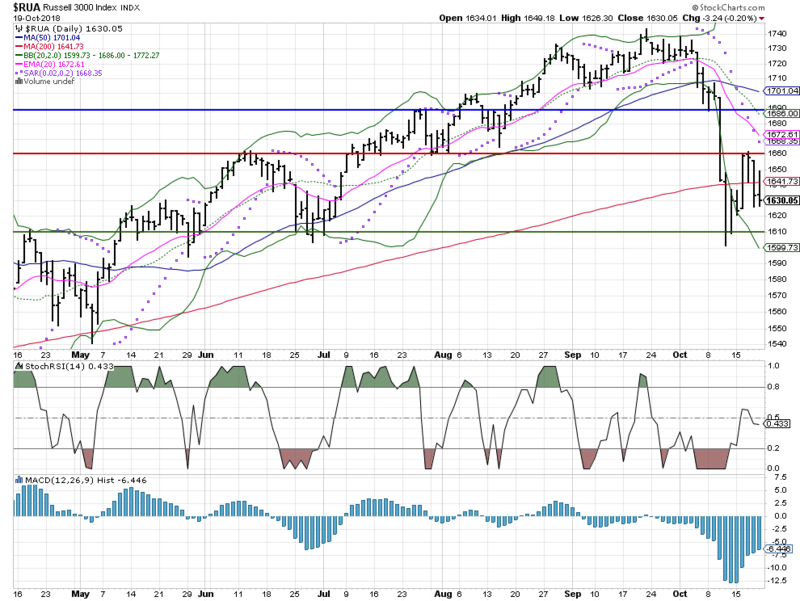 We believe that enough damage has already been done, and enough fear created, for the recent reaction lows to serve as at least a short-term bottom for equities, but that it is very likely that the markets will go back and retest those prior lows at least once. Historically, almost all declines of substance require at least one retest of their initial lows before they can launch a sustainable move higher, and our expectation is that we will see at least one such retest over the coming days and/or weeks. Our working premise is that, albeit very old, the equity bull market remains intact, and will ultimately find support at or near its recent lows. However, any sustained breach of those lows would call that relatively optimistic premise into significant question. This document may contain forward-looking statements based on Per Stirling Capital Management’s expectations and projections about the methods by which it expects to invest. Those statements are sometimes indicated by words such as “expects,” “believes,” “will” and similar expressions. In addition, any statements that refer to expectations, projections or characterizations of future events or circumstances, including any underlying assumptions, are forward-looking statements. Such statements are not guaranties of future performance and are subject to certain risks, uncertainties and assumptions that are difficult to predict. Therefore, actual returns could differ materially and adversely from those expressed or implied in any forward-looking statements as a result of various factors.